Every year, dazzling balloons, awe-inspiring floats and amazing performers unite us all in celebration. Now, with nine decades of this holiday tradition on display we celebrate with a primetime special featuring some of the most extraordinary strides in the parade's history. 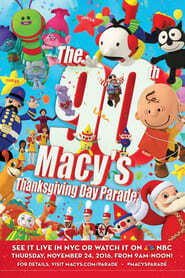 From Felix the Cat (the first giant balloon in 1927) to Snoopy (the character with the most balloons), discover the parade's rich history, relive cherished festivities, and experience the beloved stars and musical performances that have made this two-and-a-half-mile march through the streets of Manhattan a lasting tradition. It's not every day you turn 90 - let's party!